CHARLES PAPA KWABENA EBO QUANSAH, a.k.a. Charles Quansah now counting the remainder of his days on death row in the Condemned cells of the Nsawam Medium Security Prison is aggrieved. He says he needs a willing counsel to help him clear his name and doubts about his innocence in the heinous crime that literally took the country to ransom for over two years. Quansah claims the statement he was alleged to have made was made after rounds of brutal torture on the orders of officers of the Criminal Investigation Department (CID) who handled the case. His claims implicate key players as well as their subordinates who were/are on the beat, investigating the cold-blooded murder of the women about four years ago. Now it is becoming increasingly likely that if Mr. Quansah who reportedly admitted to nine of the murders pleads innocence or could only be fixed with nine then, the death squad may be roaming our streets while they wait for the opportune time to strike again. Prisons Officers at the Nsawan Prison who claimed they had made enough in-roads into the psyche of the jailed murderer also told the Network Herald that contrary to statement by the Police administration that Quansah openly confessed to killing 9 out of the 34 women, he had since his arrival about two years ago, maintained that there was a miscarriage of justice because he is innocent of the heinous crime. With four or so scars the size of the bottom of a pressing iron at his back which he insist was the result of the continuous inhuman treatment he received at the hands of interrogators (names withheld), Quansah is said to be hoping and praying that he would be able to secure the services of a lawyer who would request for an independent enquiry into the matter. According to prison officials, for starters, the convicted “serial killer” claims that the statement the Police presented to the court as his confession statement were not written by him. That he never confessed to killing the women. That while in the cells at the Police Headquarters in Accra, he was blindfolded on several occasions, handcuffed from behind, taken to an unknown location in a vehicle and subjected to hours of gruesome torture that always left him bleeding profusely from his nostrils, ears and mouth. 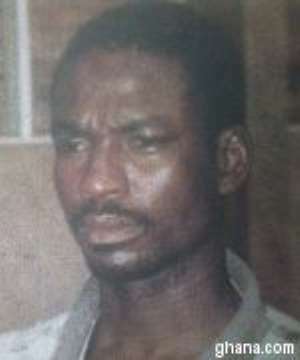 Quansah had also alleged on several occasions that his interrogators had other motives such as pushing him not only to admit killing the women but prompting him to implicate certain persons as the real architects of the serial killings even though on all occasions he resisted their promptings because his conscience would not permit him. He said on one of the usual brutalization sessions in the name of interrogation, he out of exasperation, burst out that he killed 90 of the women and not the 34 they were asking him to admit. This was according to the Officers, conveniently altered by the CID to mean he confessed to killing 9 of the women. Defense witness one George Yaw Asare Asamoah had told the court that he saw the accused on several occasions beaten and brought back to the cells battered.